Thanks to the proliferation of inexpensive IP security cameras from China, you can now purchase a pan-tilt capable security camera with night vision and a boatload of other features for less than 100 dollars. Check out our article on DIY iPhone-controlled Security Cameras for info on how to set up your own simple system. Part of any good video surveillance system is having the capability to remotely view your camera feeds, which is where the Foscam Surveillance Pro App for iPhone comes in. 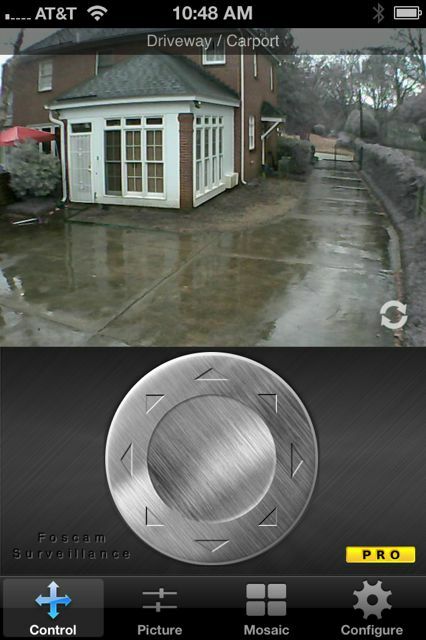 After installing the app, the first thing required is camera configuration information for the IP camera you wish to view. You must first choose a model of camera. While the Foscam Surveillance Pro app name would imply that it only supports Foscam-branded cameras, it actually supports many cameras from many different vendors. After selecting a model, you must supply the IP address or hostname of the camera along with the port, username, and password. Most cameras use port 80, but it depends on the setup of your particular camera. It is important to note that your camera must already be accessible via the internet before it will work with the app. After you successfully enter your connection information into the Foscam Surveillance Pro app, all you have to do is touch the camera's name and you will be taken to the viewer. The controls available depend on the model of camera you chose during setup. If you chose a pan-tilt capable camera, you will see a virtual joystick that you can touch to move the camera around. The lag time between when you touch the joystick and when the camera actually moves will depend on how good your connection is from your iPhone. While in viewer mode, you can rotate your phone to see a full-screen landscape view from the camera. The joystick disappears in landscape view allowing you to touch an area of the screen to move the camera instead of using the virtual joystick. You can also pinch-zoom in and out on areas of interest within the camera window. Enable / disable "patrol mode"
This app has been great for peace of mind, allowing the tester to virtually check on things at their house when away. The developer is active at resolving issues and adding new features.